Code: “a set of rules prescribing forms of social behavior . . . a system of explicit social conventions.” (Winfried Nöth, Handbook of Semiotics). Social conventions, whatever the field of endeavor, “help to structure the social world and stabilize behavior.” We learn them, as children or adults, in a specific context and for a specific purpose (the conventions of etiquette, military codes, the rules of the road). They can be general (culture-wide) or highly specific (a Girl Scout troop, a 4H club) and help govern expected behavior within those groups. The “codigos” of tango are variously described as “rules of etiquette,” “guidelines,” “recommendations,” and “codes” of behavior at a milonga. They are generally not thought of as prescriptive (although they are) but as models of preferred behavior. Their history and evolution, however—what they are specifically, when they originated, and how they evolved—remain obscure. Those who know them appear to have acquired them through experience, or mimicry, or some more explicit but never clearly stated learning process. Interestingly, in this case, explicit consequences are associated with failure to observe expected forms of behavior. More than just suggestions or recommendations, the codigos of Cachirulo are explicitly prescriptive and entail a penalty for failure to observe them. Run a stop light, get a ticket. A similar list was provided by Juntos, a “traditional” milonga in London (now closed). Once again, the majority of the codigos referred to floorcraft, behavior on the floor, and use of the cabeceo. But at Juntos, they also included a dress code. And like Cachirulo, consistently flouting the codigos could lead to expulsion from the milonga. In these cases, the codigos are made clear to all dancers and, like certain institutional conventions, such as traffic regulations, there are penalties attached to flouting them. Juntos and Cachirulo, however, would seem to be the exceptions. 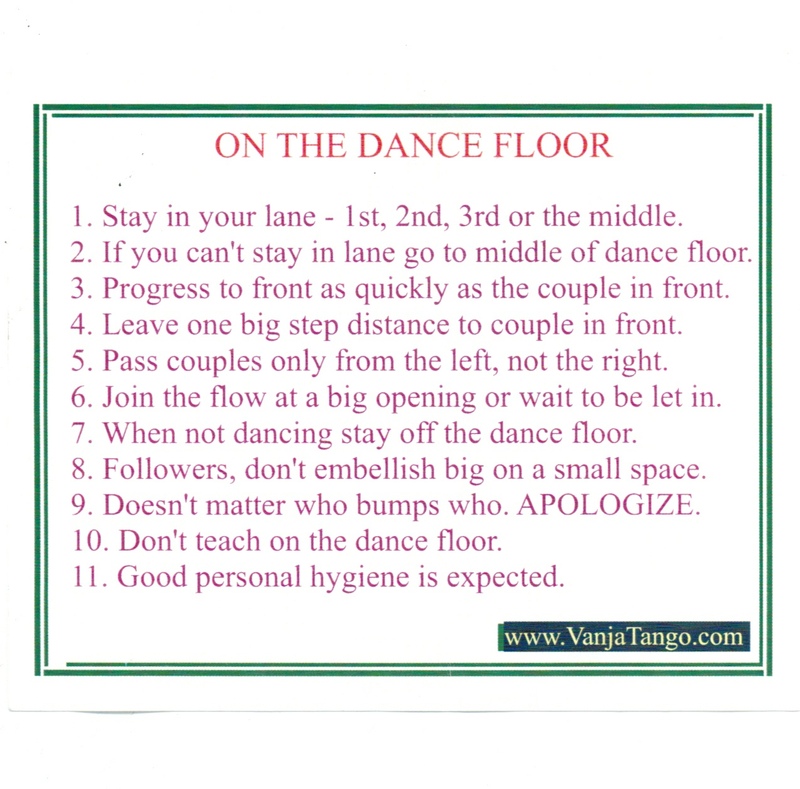 It is assumed—often wrongly—that dancers on the floor will have internalized the codigos so they do not need to be reminded of the finer details of behavior and etiquette. This may be true in Buenos Aires, where dancers have grown up with such traditions; for them the codigos are as much a part of tango as the music and the dance itself. Elsewhere, they must be taught as an integral part of the process of learning tango. That is, they should not be considered an afterthought or an inconvenient addendum to some form of freeform dancing. Which means that, for most of us, the specific conventions of tango will need to be spelled out—whether by a teacher or a more experienced dancer makes no difference—along with the intricacies of the dance. We can try to learn them by mimicking the behavior of those who have learned to incorporate the codigos, but in doing so, we can never be certain of what we are learning and can just as easily absorb bad behavior as good. Although the codigos of tango are “simply” conventions and frequently ignored (or never learned in the first place), they do something more than provide a signpost to acceptable behavior. Where they can lead us and why they are important is shown by the following quote from Juntos, in London. Photo by Thames Valley Tango of one of their milongas. It is the awareness of being part of a shared community that makes the codigos something more than a distracting annoyance. As implied above, when everything is functioning smoothly and everyone is cognizant of their role in that small community of kindred spirits, we are in the process of building toward something that we cannot achieve on our own. If we are willing to make the commitment, we will dance primarily for the beauty of the ronda, then for the beauty of the couple, and finally for ourselves, but never for an audience of bystanders. We become part of a beautiful wholeness, one that extends beyond the boundaries of our individual selves, a community of individuals working toward a shared emotion. Someone once described a well functioning ronda as similar to a flock of birds wheeling across the sky in formation, rising and falling on the air currents. Collectively, a thing of grace and beauty, they circle, seemingly without beginning or end; unique individuals all, yet joined in flight as a single organism. No leaders, no followers, only motion and stasis. You are currently browsing entries tagged with floorcraft at Tango High and Low.